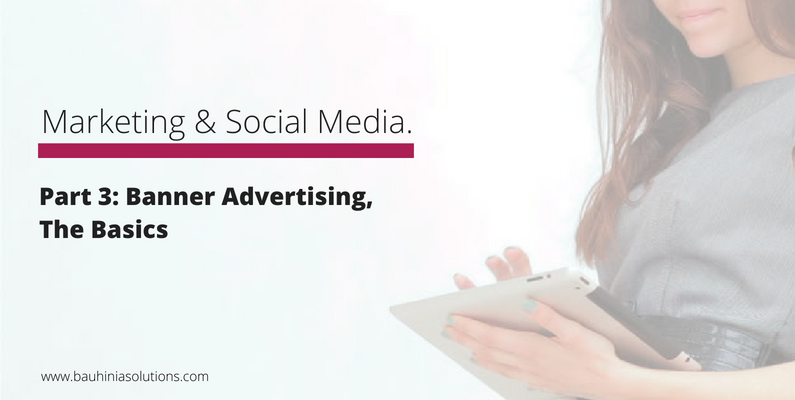 In previous posts we discussed, what is banner advertising? and does banner advertising work? In this post we provide you with the basic terminology if you wish to start exploring banner advertising opportunities available to you. CPC – Cost Per Click – a pricing model that only charges the advertiser when the ad is actually clicked. Although the cost can be higher, the quality of the lead is usually better, so if you are on a budget, CPC is worth considering. This can also be beneficial if you want to engage in a branding exercise on a budget. Warning – for CPC to be effective – it has to be micro-managed. CPM – don’t be fooled by the M – CPM is the Cost Per Thousand Impressions. CPM models are excellent for branding exercises and for big splashes because you can designate how many times your ad will be seen in a specific time frame. If you have an ad with a strong call to action, CPM can save you a bundle over a CPC campaign (discounts, prizes, giveaways, etc.). These are also more “set-it-and-forget-it” type campaigns. Click (or click-through) – someone actually, physically clicks on your ad and is redirected to your designated landing page. Sorry – there is no way to guarantee the quality of the click – that is up to you and your ad. Impression – any time a page loads that has your ad on it. Yes, it still counts if someone clicks away before the entire page loads and Yes, it still counts if you ad is all the way at the bottom of the page but the reader never scrolled down – the server sent the info – that is what is counted. CTA – Call to Action – your banner will be more effective as a lead generating tool if it contains a reason for the reader to click. Surprisingly, it is still far more beneficial to literally put “Click Here”. Web-surfers are lemmings just awaiting instructions. ROS – Run Of Site – your ad will appear on any/every available page of a site, and may be accompanied by size restrictions or category restrictions. For example, a straight ROS Leaderboard will be delivered to the top of every page of a site. A hypothetical Category ROS Boombox would be delivered to any page within the specified category, which also serves the banner size designated. It is always a good idea to clarify exactly what ROS means to the specific seller. Rotating – very common, but a rotating space can make it difficult to find your ad once you have placed it. In a single space, there may be a number of ads that are paying to be delivered. To optimize performance, sites will place these ads in the same position and deliver them randomly so that every time a page is refreshed, a different ad appears. Depending on the seller, CPC and CPM ads may be rotating together. Landing Page (or Destination URL) – where the reader goes once they click on your ad. This is the SINGLE MOST IMPORTANT point to consider for conversion, so consider wisely and be strategic. Roadblock – owning ALL of the available banners on a given page. These are pricey, but great for launches and generating a high conversion rate. They also ensure that you won’t be sharing space with your competition. If you spend the $$$ on a Roadblock, get creative and engaging – use the various positions in an innovative and unexpected way that will get the reader interested and want to know more. Skin – a rare and pricey option, but oh so cool. Skins are almost always an additional service on a Roadblock or large advertising package, but they give you the option to replace the website background with an image of your own. Hire a designer for a high-quality, optimized image – always. Boombox – generally, a square-ish advertising space, most commonly found on the right-hand column, middle third of a page. A Boombox is the most versatile unit, creatively speaking. Industry Standard size: 336×280, but may vary. Skyscraper – a tall, thin, banner size most commonly found on the right, outermost column. These are great because you can maintain visibility as a reader scrolls down the page, but they can sometimes be challenging from a creative perspective. These do not lend themselves well to too much text. Industry Standard size: 120×600, but may vary. Leaderboard – the wide banner across the top of a web page. Primo visibility, so generally top dollar price tags. A short and powerful statement can be very good and effective on a Leaderboard. Industry Standard size: 728×90, but may vary. Animated GIF – these look like video, but are actually animated picture files. Low resolution and short duration make these “cheap video” that needn’t be hosted elsewhere and loads quickly, even on a poor connection speed. Rich Media – one of the newest trends in banner advertising, a Rich Media Banner is immersive, interactive, and engaging. The possibilities are nearly endless, but can include surveys, signups, video, “pushdowns”, “sliders”, and so much more. Often times, a user can interact with the ad without leaving the content page they are viewing, which is a benefit to both the reader and the seller. With the right design, these are truly powerful tools. Expect a price tag (from your designer) to match. These can come in any size. Symantic Linking (or Keyword search) – your ad (CPC or CPM) is delivered against content that is deemed relevant by a search algorithm. This happens most notably on search engines, but can also be a way that large publishers or rich content providers deliver ads. You select tags or keywords related to your ad and when the page contains those words in the actual content of the page, your ad appears. Excellent relevancy if you pick your keywords strategically. Funny story – a science company is advertising a particular type of equipment, very technical, capital equipment kind of stuff. They are looking at their metrics after a month of big CPC spend on Google and find that they have an almost 100% bounce rate. (That is very bad, a total waste.) They look at their very limited keywords and typed one in to see what else was showing. Sadly, they discovered that “high-throughput” and “automated” received almost no clicks, and while popular, their selection of both words “penetration” and “prick” were ill-advised. Conversion – the Golden Ticket, the pièce de résistance, or just generally the whole reason your advertising campaign exists. A conversion can be defined by your campaign and your advertising goals. Whether it is a newsletter sign up, an inquiry, or a full-on sale – congratulations! You did it! A complete stranger has now interacted with your business; now pop a glass of bubbles to celebrate!